Can Bee Products Alleviate Arthritis Symptoms? Home > Joint Supplements > Can Bee Products Alleviate Arthritis Symptoms? Apitherapy, one the whole, focuses on the use of bee products as health supplements for various health complaints, including arthritis and arthritis symptoms, multiple sclerosis, fibromyalgia and even sexual dysfunction. The most common form of apitherapy concerns the use of bee venom, which is reported to provide relief for inflammatory conditions, as it promotes the production of cortisol through the protein melitten. Released by the adrenal glands, cortisol is a natural inflammatory. Bee stings are also thought to trigger the body's auto-immune response and thus start the healing process. 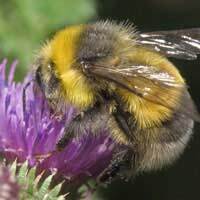 Bee venom is therefore is seen as a natural health supplement that could have benefits for people who suffer from arthritis symptoms, as it is purported to ease sore joints, and help people cope better with muscle stiffness. In a recent study it was found that melitten is instrumental in blocking the expression of any inflammatory genes that cause the painful swelling of tissue, particularly in patients with rheumatoid arthritis. However, the study was conducted only on animals. How Do They Get Bee Venom? They don't, you do. People interested in BVT can purchase a box of bees, which can last up to a week, and let the bees sting them. This is accomplished by holding the bee with a pair of tweezers, placing its belly on your arm, and waiting. Once the bee stings patients allow the stinger to stay inside their arm for about 15 minutes for maximum effect. This is thought to help in particular with arthritis symptoms. Can I Purchase Bee Venom Products Without the Sting? Most hive products taken as health supplements containing nectar, propolis, pollen etc can be bought easily in a health food store. They can include bee venom extracts, which is also popular amongst people who practice homeopathy. Bee venom honey as a health supplement to treat arthritis symptoms is also available, and some is purported to be safe even for people who are allergic to bee stings. Tread carefully (see Words of Caution, below). What About other Bee Products? Honey: various honeys, manuka in particular, are thought to be good for our health and help the body resist and fight off infection. Some people believe that taking spoonfuls of certain honeys can help desensitise people with seasonal allergies. Bee pollen: direct from the hive, it is used as a health supplement after being cleaned and placed in a fridge with a dehumidifier to remove moisture and not allow it to break down. The pollen then can be sprinkled on salads or other food or mixed in cool drinks. Said to provide the antioxidants that remove free radicals from our bodies. Royal jelly: thought to help with a wide variety of ailments, including problems with the nervous and cardiovascular systems and others. These supplements are also thought to have anti-ageing and energy-enhancing properties, be a natural antidepressant and lower cholesterol. Is secreted from the glands belonging to worker bees. Propolis: health supplements containing this have all vitamins except for vitamin A, and many minerals. Purported to help boost the immune system and fight infection. Is a tree resin bees use to seal hives. BVT, whether in the form of actual stings or extracts, can cause anaphylaxis, an allergic reaction that can be fatal in some people. Similarly, people who are allergic to bees can also suffer unpleasant and often dangerous symptoms when they come in contact with bee product health supplements such as pollen and/or royal jelly or nectar. Asthma and anaphylaxis are just two of them. Stay away from health supplements containing bee products to treat arthritis symptoms if you are allergic to bees! Why Does Cortaflex Improve Joint Function? What is CMO Used For? Can Cod Liver Oil Help my Joints? What is MSM and How Can it Help My Joints?